With no small amount of wonderment at myself, I went on an extensive dice hunt this month for a game I am not at all likely to run. The game? Dungeon Crawl Classics. This post is not about the game though, it’s about the dice. It took me years to get my first set of dice, and several years more before I got my second set. These were enough for me until I started playing Star Fleet Battles more regularly. Something about acquiring a pile of D6s breaks down a man’s barrier to sense when it comes to acquiring more dice, I guess. When Storyteller came along, I was an avid purchaser of D10 sets and lugged a ton of them, plus one lonely opaque black 7-die polyhedral set to Korea with me, just in case. Over my years here, different sets of polyhedrals have been acquired for various reasons… an attempt at a Call of Cthulhu campaign, and the one-shots which followed, a few attempts at Palladium Fantasy campaigns, and so on. I even have two nice sets of FATE dice for reasons which elude me. I have enough D6s to build a wall to rival a certain one a ways north of here. Apparently, that is not enough. I may have what some think of as too many dice, but I have never been one to buy truly frivolous dice that I could not use. Seeing the listings for dice running from D3 to D30 and realizing that there was an actual purpose for all of them in this game sent me right back to that day where I finally stumbled across a set of dice in my local book store, about two years after I had started playing. Can you imagine/remember having to borrow dice for two years? Fortunately, my original partners in the crime of playing D&D were all in the same boat and we shared the GM’s set of pale blue dice from the red box. My first set of dice was a precision, red crystal 7-die pack from the Armory. They were a find I did not expect, in a place where I did not expect to see anything related to gaming at all. I don’t know for certain that precision dice make any difference in terms of outcome, but the fact that they still look sharp and new more than 20 years later while those creepy blue dice were worn out not long after leaving the box must stand for something. This quest for dice was a very different experience, but strangely, no less thrilling. I even counted the days until delivery. I like to think my dog kept an eye out for the mailman, and would prefer not to be disabused of that notion. Unlike that first time, where one set of dice would do me for many years to come, this time I knew I would need to order three. 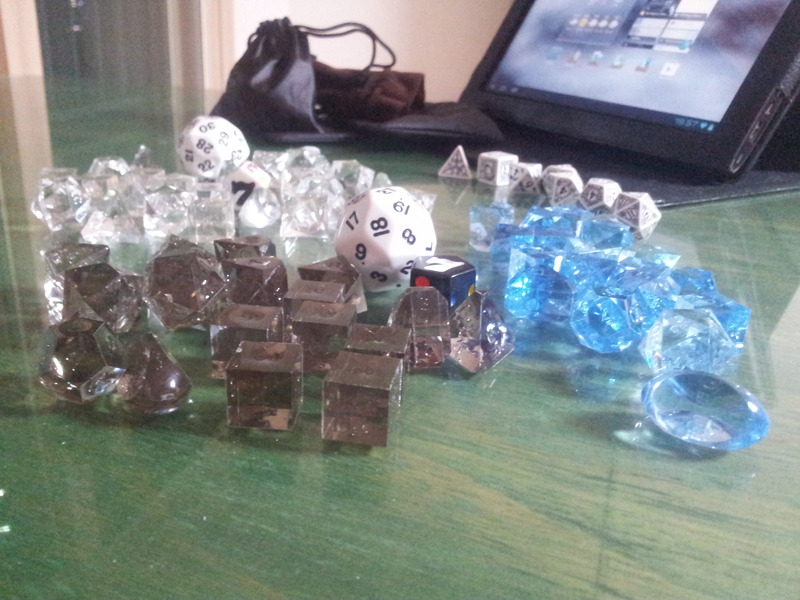 Three complete sets of dice with additions to reflect my distant and not so distant memories of regular fantasy play. In the end, my idea of a good set of dice came out to be 1D3, 3D4, 1D5, 6D6, 1D7, 3D8, 1D10, 1D%, 1D12, 1D14, 1D16, 1D20, 1D24, and 1D30. I got this arrangement of dice in three sets, and therein lay the rub: there are no sets! There are no sets, there is only Zuul. The D7 and the D30 come in very few colors, and these colors do not tend to match the shade or the opacity of the other less common polyhedrals sooo… generally speaking if you care about having your dice match, you are out of luck. The D7 comes in just two colors. In the end I purchased a smoky quartz set to which I added a black D7 and a black D30 (meh), a diamond set to which I have added a white D7 and D30 (double meh), and a blue moonstone set which was contaminated by a few sapphire dice on the shipping end and to which I have added nothing but annoyance. No matter where I looked online, I had to make exceptions for one or more dice along the chain. There simply were no sets or even runs of dice spanning such a long chain of dice. It is easy to order the individual dice that you want, and to a certain extent you can get these dice in matching forms, but as far as I can tell you cannot yet get all of them. The closest I have found runs from D4 to D30 in opaque white, but that brings us to another aspect of dice purchasing: type and size. Even that set does not have dice of a consistent or at least relatively matched size. D30s tend toward the enormous and some configurations of D14 and D16 are scarcely slender reeds. Generally speaking it is hard to get these latter two dice in spherical versions which I feel produces a better looking and more evenly sized, if more confusing, set. I don’t know about you, but I prefer a certain amount of conformity in sizing between the different dice in a set. From what I found in my recent hunt, this is not a stage at which we have arrived. I did stumble across this Kickstarter campaign for “All the Even Dice” which includes a D18, so that might help. What is particularly nice about this campaign is the focus on producing spherical versions of the D14 and D18. Color choices are the typical rainbow assortment of opaque dice, but it’s a start. In a similar vein, the FreeBlades dice sets offer a run from D4 to D30 either in mixed colors or all white, again opaque. As I mentioned above, however, what this set has in the way of matching color and material, it lacks in matching sizes. Based on my researches this month, if you can find a D3 and D5 in an opaque white version, this may be the only current way to make a full set. Eye-bursting yellow would be an option that would also let you recruit a D50 for your menagerie of dice, but alas, the D7 only comes in white and black. So, at this end of my search I still desire to find a more satisfying solution for the D30 and the D7. I don’t expect there to be much call for the D7, but it would be nice if a wider array of colours and smaller sizes for the D30 could be arranged. Right now my diamond set looks like a bunch of shaved ice trying to hang out with a golf ball. What have you done to round out your dice sets? Where have you searched? My searches took me to many places but the ones I would recommend are FRP Games, and Game Station. Neither have exactly what I was looking for, but both made it possible, and more importantly easy, to build the sets I wanted; within the limitations of what the manufacturers actually offer. I’d like to hear about different vendors, if any who read this have had some success with them. Game Station’s 14-die set and easily searched stock made things really easy to build, so right now they are the site I would choose were I to do this again. Dice, like cars, need to be a certain color in order to function properly in conjunction with each individual.